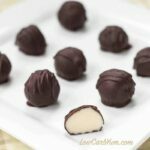 It’s nearly impossible to find good low carb sugar free chocolate kisses molded candy. 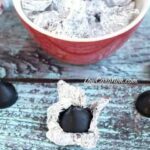 Why not make it yourself using kiss drop candy molds? Sweets and holiday season always seem to go hand in hand. It’s nice to be able to travel with some bite size treats of your own so you won’t be tempted. I ordered a Kiss Drop Chocolate Mold off Etsy a couple weeks ago. The seller happens to be in New York so it only took a couple days for it to arrive at my house in Connecticut. When I have the time, I like to make individually wrapped low carb candy. I have a lot of fun making sugar free tootsie rolls. I’ve brought those into work and my coworkers were surprised when I told them they were sugar free. 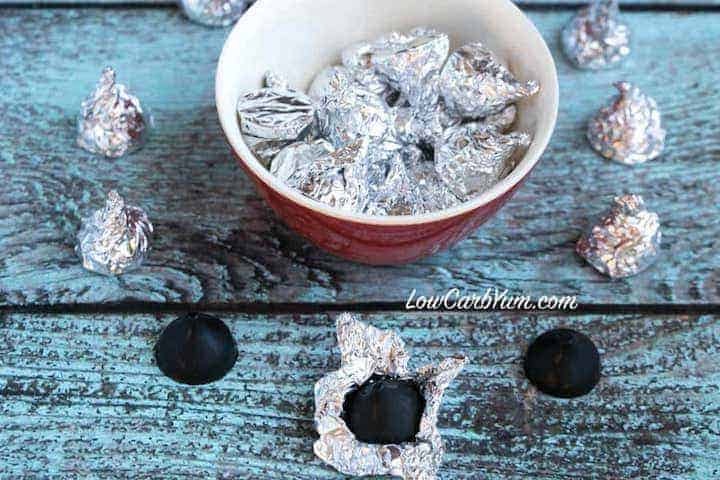 For the holidays, I made some homemade sugar free chocolate kisses and wrapped them up in aluminum foil. I just used regular colored foil, but they would look even better wrapped in red and green foil candy wrappers. Each chocolate kiss uses about a 2×2-inch square of foil. These can probably be found in craft stores. 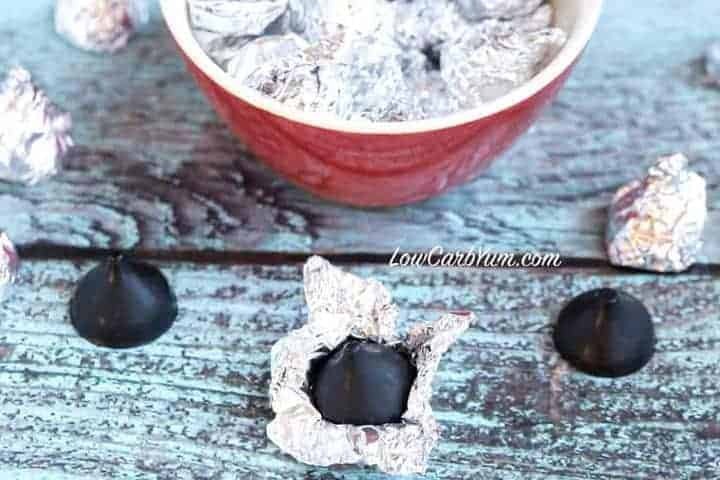 The red candy foil wrappers would be perfect for making these sugar free chocolate kisses for Valentine’s day. And, the green foil candy wrappers would be nice for St. Patrick’s day. 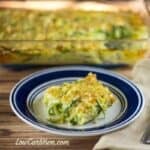 Any leftovers could always be used for next Christmas! 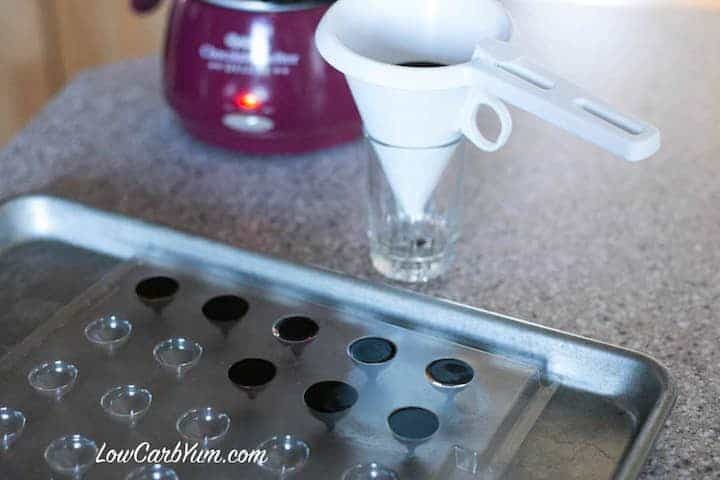 If you plan to do a lot candy making using chocolate molds, I highly recommend buying an Easy Pour Funnel. It’s makes things so much easier with virtually no mess. I never pour chocolate without mine! 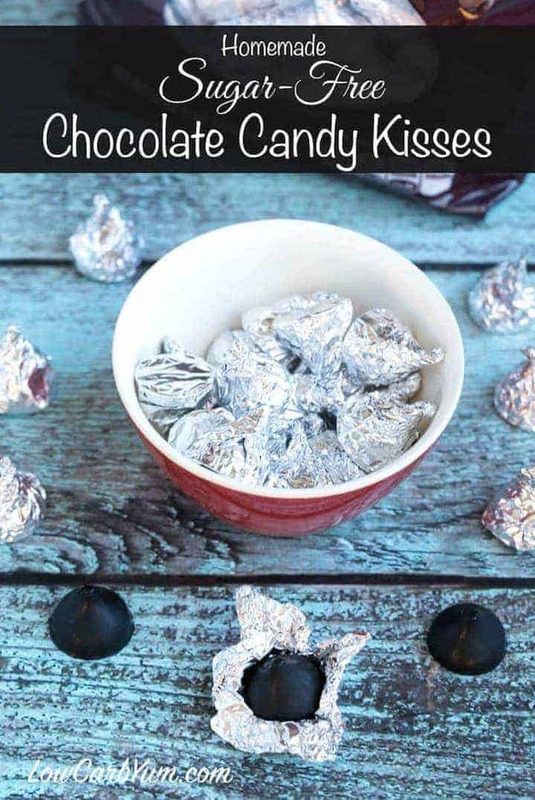 Unlike the regular kisses, these sugar free chocolate kisses molded candy are made with dark chocolate. If you want the traditional milk chocolate, you’ll need to add a milk powder which can add additional carbs. The best milk chocolate that I’ve found are the Sukrin chocolate bars. They come in regular milk chocolate and salted milk chocolate with almonds. 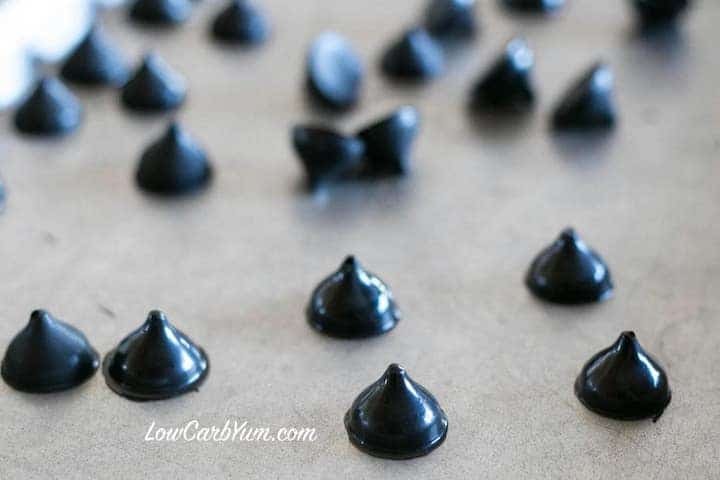 It’s nearly impossible to find good low carb kisses molded chocolate candy. Make it yourself with this homemade chocolate recipe. Melt baking chococlate, cocoa butter, and powdered sweetener over low heat or double boiler until melted completely. 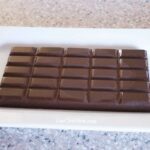 Remove chocolate from heat and stir in stevia and vanilla extracts. Pour melted chocolate into molds. Refrigerate or freeze until completely set. 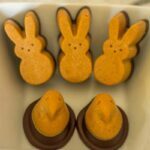 Remove chocolate from molds and enjoy! How many kisses per serving? This recipe has gotten me really interested in making my own sugar-free chocolate treats! Instead of Stevia, I’m using Xylitol because there’s less aftertaste and a softer quality to the sweetening. 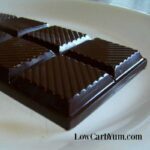 Unfortunately, I’m also using Raw Cacao powder instead of already-made unsweetened chocolate bars. As my experiment, I used 2 TBSP each of Cacao Powder, Xylitol and water and mixed over heat to a smooth paste, then added almost 2 TBSP of raw Cacao butter (maybe 1.8). This turned grainy until I added a dash of vanilla, then it got silky again. 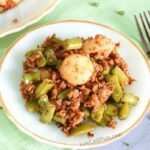 I spread it on rice crackers and sprinkled coconut on top, put into the fridge for 4 hours. The chocolate never hardened – it got stiffer, but it wasn’t the candy-coated rice crisp I had hoped for (besides which the rice softened up too). Because of this I have held off purchasing the chocolate molds I wanted: if it won’t harden, there’s no point in trying to mold it. 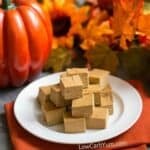 Do you have any hints on making these without using the pre-made bars of chocolate? Maybe I needed to double the cacao butter to make up for it (seemed like there was already too much, though – maybe less would have been the ticket)? You can try adding raw cocoa butter. That typically will get it hard like chocolate. 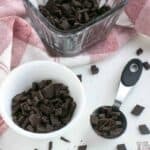 could you add heavy cream instead of powder to make it more like milk chocolate? 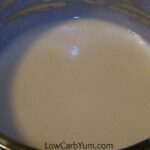 Cream is all fat so it shouldn’t cause problem of milk and make it clumpy. If you don’t use too much it should still hold its form, if not you could make truffles. Another idea, you could use flavoring such as caramel or mint, but make sure they are oil based. There might be too much liquid in the cream. I think I may have tried that once, but don’t recall how well it worked. You could try like a tablespoon or less. Thank you Lisa! What excellent timing you have for something that to me is so yummy and now cute too! I already ordered my supplies hoping to whip them up before Christmas. I hope your order comes as quickly as mine did. Have a great holiday! I thought about adding half an almond to each kiss. It would be perfect!